Black nail polish, camo shorts, AND denim vests? Dark lords Type O Negative will hit the road in May with kings-of-the-breakdown Hatebreed and goat-horders 3 Inches Of Blood. 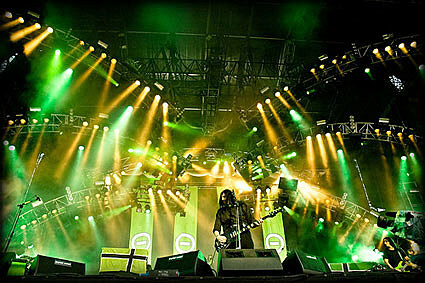 Tickets for a New York date at Terminal 5 are not on sale yet, but a Type O Negative show at Starland Ballroom on May 5th goes on sale Friday, March 28th at noon. Tickets are also currently being offered on pre-sale for select shows (not NYC so far). Tour Dates and videos for “September Sun” and “Trial Of Champions” below…. Speaking of Jamey Jasta‘s band, he’s got another one as well with the six-string king of N’Awlins Sludge, Kirk Windstein of the thoroughly awesome Crowbar and Down, called Kingdom of Sorrow. It’s out now, and it sounds pretty much what you would think it sounds like…. Jamey “crooning” over Kirk’s doom heaviness. Check out KoS jamming on the Crowbar classic “All I Had (I Gave)” below. UPDATE: Kingdom of Sorrow have some shows coming up too, and it ends up…..they’re opening for Type O Negative. All dates below…..